← A Melon for Ecstacy. Cauliflowers have proved a very fruitful design source for ceramics; the delicious texture of their creamy, curdy centre that contrasts so well with the emerald leaves has been an absolute gift to anyone who works with white earthenware and copper oxide. Who am to say otherwise? I wanted to use a cauliflower in my Tortures partly because they are one of my absolute favourite vegetables (especially in curries) but also to follow in the proud tradition of Cauliflower ware. 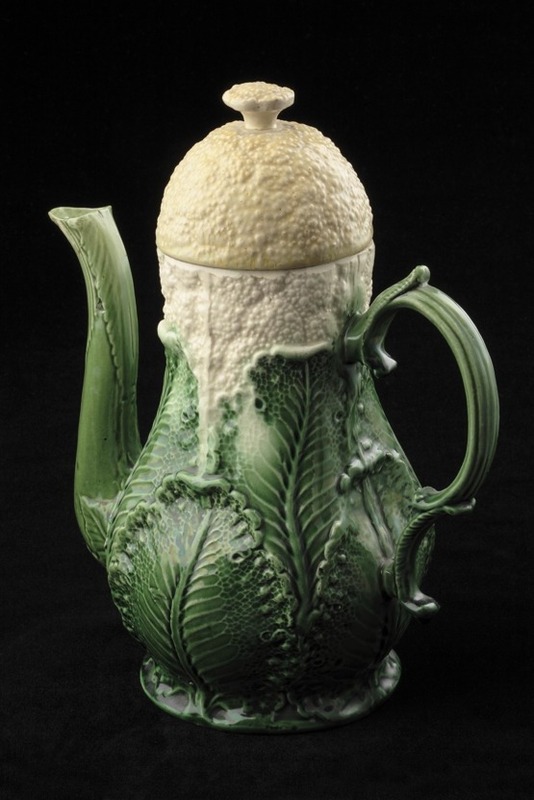 Josiah Wedgwood was not too proud to include the humble cauliflower in his ceramic repertoire. 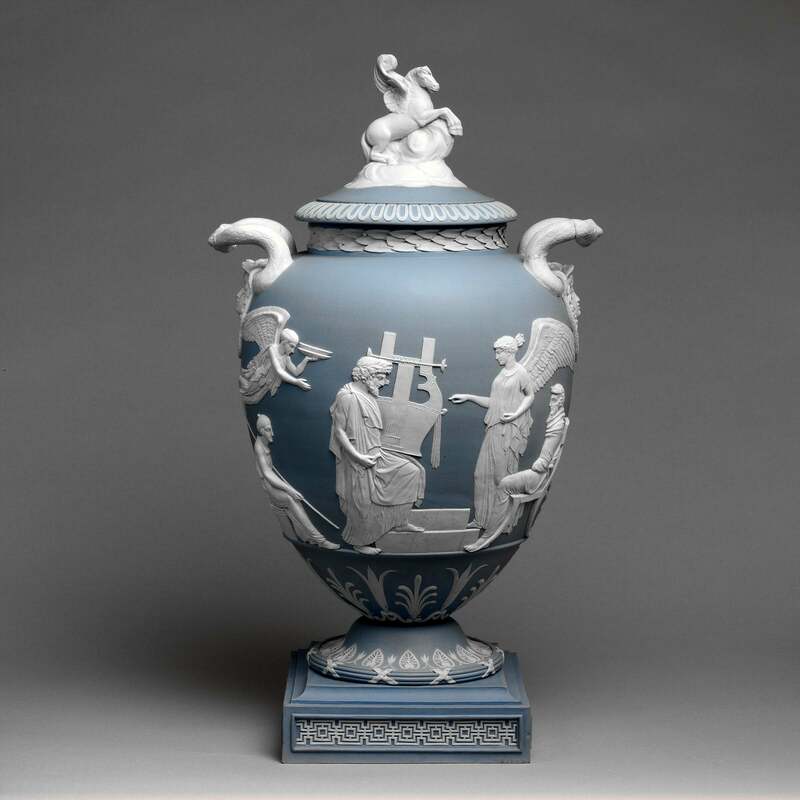 You might know the name of Wedgwood for his famous Jasper ware – pale gods and goddesses gambolling on a matt blue background, like this mighty vase. 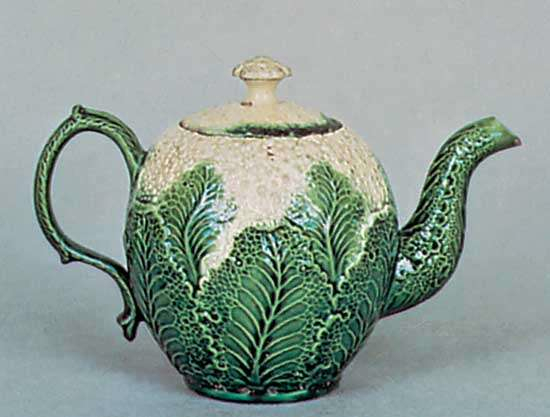 In his early years Wedgwood experimented with new coloured glazes, and one of his first achievements was the vivid green used on this coffee pot. A very small part of early Wedgwood production are these naturalistic earthenware fruit and vegetable forms made around 1760. 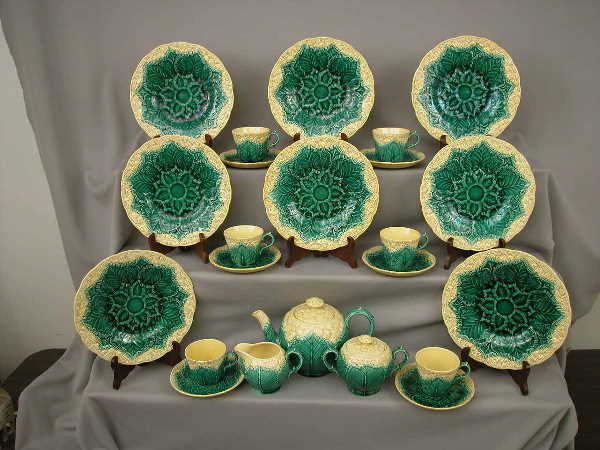 Cauliflower ware had the lower part modelled to resemble the leaves, and was covered with a brilliant green glaze, derived from copper oxide. The cauliflower head was either cream or yellow, using the natural colour of the clay. Wedgwood wasn’t averse to a few pineapples either (neither am I but more of than to follow)! I think these two ginger jars are absolutely delicious. Cauliflower seems an obvious choice to be tortured. My interest in how we produce our food and control pests that interfere with its production made me remember myxomatosis, a ghastly rabbit disease which was deliberately introduced into the UK in 1953 in an attempt to control wild rabbit populations. Affected rabbits develop skin tumours, and in some cases blindness, followed by fatigue and fever; they usually die within 14 days of contracting the disease. Unfortunately I’ve had the misfortune to see a few affected rabbits on Skye and they were not a pretty sight. If I say that this is one of the least revolting pictures I found (and I’ve seen far worse in real life) you will understand what a vile disease this is. The worst part of it is that it doesn’t work, wild rabbits quickly developed an immunity to it and if the bunnies on my croft are anything to go by, they are even more rampant than ever. So I set about making my own diseased cauliflower. And why the hell not? after all, I already have the bunnies. I made a press mould from a real cauliflower. It was a simple matter to add the bunnies (as they were slip cast I had to allow for a different shrinkage rate so I slotted them in to precut holes rather than joining them. The glaze will hold them in place after the second firing. The piece was painted with underglaze colours and oxides. And for once, I’m quite pleased with the finished piece! I just wanted to add that a lot of my inspiration comes from seed packets. I’ve always loved them and I am not alone. This is what Betty MacDonald had to say about them in The Egg and I. * I could have written it myself, only I’m not as witty and clever as Betty. “I think seed catalogues are the most exciting things there are…… On gray soggy November days I pored over last year’s catalogues, and after an hour or two I could look out at the squishy landscape without shivering, for I could almost hear the hum of bees, feel the summer heat and see the yard wallowing in tropical glory. Since the arrival of the internet I often warm my virtual fingers over vintage seed packets and I mean to have at least one post devoted to them but for now I will leave you with this absolute gem, designed more recently. This fabulously bonkers seed packet was designed by Kenny Be, a graphic artist based in Denver, Colorado. I stumbled on his work by mistake and I have been totally blown away by his almost psychodelic, brilliantly inventive designs. This entry was posted in ceramics, Pleionexia, The Vegetable Tortures, Uncategorized. Bookmark the permalink.